When I discovered Craftsy I found expert-led tutorials, free patterns, and a great place to shop for fabric and crafting tools. 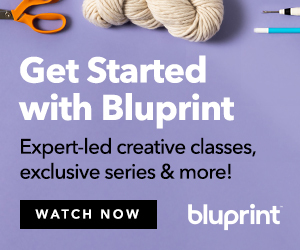 I stream Craftsy tutorials on Bluprint. Now is the perfect time for you to check it out! I recommend Craftsy because it’s a place I go to learn and shop (especially during a sale). If you want to learn how to quilt from start to finish, Craftsy has classes for you. If you want to try a new technique like paper piecing, Craftsy has classes for you. If you need fabric, tools, and supplies, Craftsy has a sale for you! Enjoy your weekend by checking out our newest collection, Winter Song. Read about it HERE on the blog. Find the Sentiment Panels, Print&Quilts, and Paper Piecing Patterns in the shop. Here are some of my favorite online classes, fabric stash builders, and quilting tools. From how to piece a quilt to how to bind a quilt, the experts show the way. Start a bullet list of classes as you browse through the links.